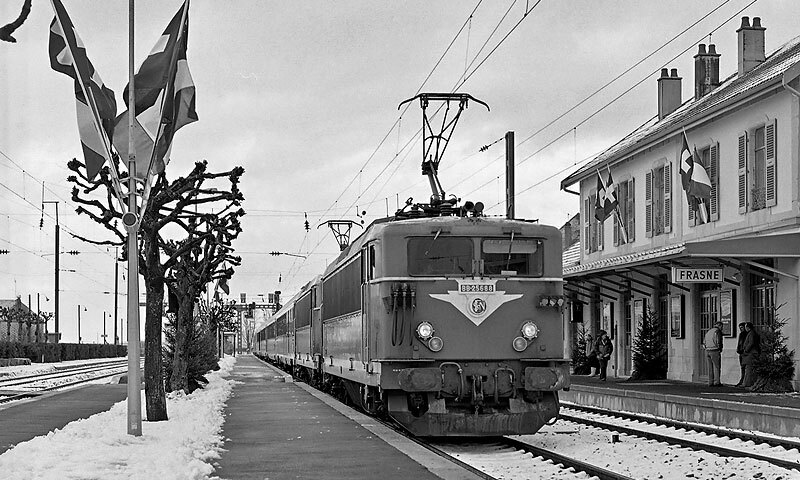 Parisian depot of Montrouge (West region) as well as the one of Dôle (South East region) received the first brand new BB 25500 from the summer of 1964. In the first depot, their arrival comes simultaneously with the step by step power up 25 KV 50 Hz electrification of the Le Mans-Laval-Rennes line, continuing the 1500V DC coming from Paris, put into service well before. In Franche-Comté region, BB 25500 of Dôle replaced BB 16500 and 12000 used until then under the 25 KV 50 Hz overhead lines. Dôle station was then showing the feature of having switchable tracks, alternatively supplied with 1500 V DC or 25 kV AC depending on itinerary, thus allowing interchanges between locomotives using each type of current. As dual current locomotives were then at the experimental stage, such a solution had to be retained. BB 25500 were used on the whole Paris-Dijon-Vallorbe line with prestigious international trains to Switzerland. But they were used on all types of trains. Their ability to multiple unit use (two locomotives) allows them to climb 20‰ ramps between Dôle and Vallorbe with higher loads. Two pictures of BB 25500 from Dijon depot at Frasne station on the Dijon – Vallorbe line where they had a difficult (20‰ ramps) and diversified duty from the start of their career, including on France to Switzerland international trains. Frasne station is close to Swiss border. Above : a multiple unit with BB 25688 in front, pulling an international train. Station is decorated with flags. Below : a beautiful picture in the snow. BB 25684 is seen pulling train 429 "Jean-Jacques Rousseau", composed of cars in the nice C1 livery. Arrival of more powerful BB 25200 in Montrouge depot at the end of 1965, pushed out BB 25500 from the most prestigious trains service. With their double gear ratio (140 / 90 km/h or 87 / 56 MPH), the BB 25500 as versatile locomotives had not seen their use decreased at all. As a matter of fact, following year, the old 2D2 5400 from Montrouge depot were progressively transferred to Bordeaux depot soon followed by the BB 900 also going on South-West region. At the end of 1965, a third depot received some BB 25500 : Marseille-Blancarde. 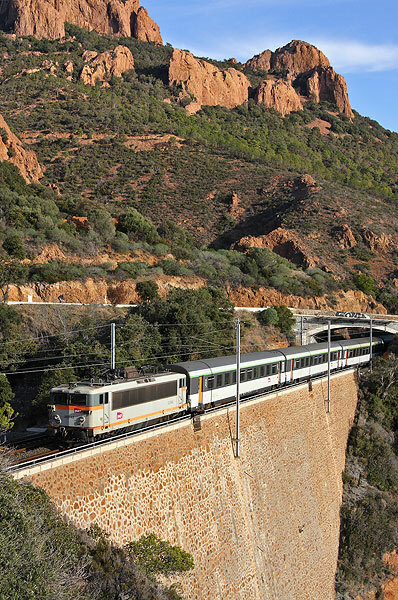 This because of the first step of the Marseille-Toulon-Nice-Vintimille line electrification, along the Mediterranean Sea. The BB 25500 then replaced 141 R Fuel steam locomotives in the same depot but also other locomotives from Nice and Miramas depots as well as BB 66000 and 67000 diesel locomotives from Nîmes depot. 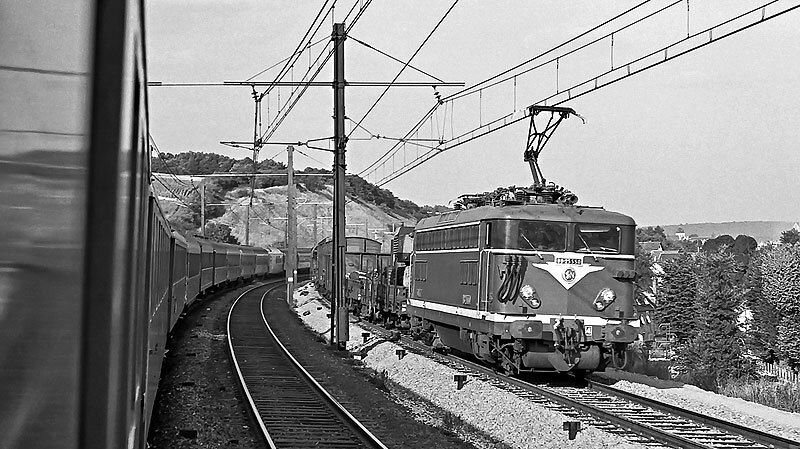 Full Marseille-Vintimille line electrification power up took place in 1969. On fast and express heavy trains, the BB 25500 were progressively replaced by the BB 25220 to 25246, able to run at 160 km/h or 100 MPH also delivered at Marseille-Blancarde depot. However, the BB 25500 were still used on a few express trains between Marseille and Nice, and mostly used on numerous freight trains riding on the Côte-d'Azur, mainly at night. They shared the local passenger services with some diesel railcars. During summer peak time, the BB 25200 were not in sufficient number to take over the many additional trains (especially night trains). The BB 25500 were therefore actively contributing to this service, their speed imitation of 140 km/h / 87 MPH not being an issue on the rather curving Côte-d'Azur line. Meanwhile, the Chalindrey-Dijon line electrification occurred but did not bring any additional duty to the Dijon depot locomotives. As a matter of fact, on this line supporting a heavy freight traffic linking Lorraine region to South East, the BB 25100 of Chalindrey depot were having a near-monopoly. On the opposite, the power up of the Dijon to Besançon line in September 1970 offered new service to the BB 25500 of Dijon. They soon reached Belfort, Besançon and Mulhouse with all kind of trains. On the Paris-Dijon-Vallorbe line, delivery of the first two CC 21000 took away the most prestigious trains from the BB 25500. In preparation of electrification of the “Grande Ceinture” (circular line around Paris area), a new depot received some BB 25500 : Les Aubrais. This depot already had a hundred of BB 8500, a series of locomotives for 1500V DC only, directly based on the BB 25500 type. Eventually, the 194 BB 25500, were all delivered in January 1976. Montrouge, Dijon and Marseille depots had even more locomotives and Les Aubrais one reached a number of 50. Electric traction interconnections between South West and South East lines electrified with 1500 V DC on one side, and Eastern and Northern lines electrified only in 25 KV 50 Hz AC then became effective. Thanks to their ability to use both types of current, BB 25500 were obviously the right locomotives to take over all kind of freight trains in transit via the “Grande Ceinture” (circular line around Paris area) recently electrified. In order to off-load major shunting yards around Paris, they took over inter region trains from Tours-St Pierre or Les Aubrais up to Lille, Somain, Le Bourget. From 1977, Marseille-Blancarde depot took delivery of the first BB 22200 with thyristors based electronic equipment. Their commissioning and setting was somewhat difficult. But soon, these dual current locomotives went on the Côte d'Azur line on their first regular trains and progressively replaced the BB 25200. These ones were then transferred to Montrouge depot. It was then Dijon depot which received some BB 22200. This meant strong competition for the BB 25500, outperformed in terms of power, speed and driving comfort. BB 22200 deliveries were actively carried on. BB 25500 were more and more concentrated on the inter yards freight traffic going via the “Grande Ceinture”. To ease this intense service and take into account the electrification of west interconnection around Paris, a new depot received some BB 25500 : Achères. In the mid-seventies, the BB 25500 started to be used on suburban services with RIB or RIO reversible stainless steel trains and then on the VO2N and VB2N double deck trains. Their cables for multiple unit drive also allowed their use with reversible trains. It’s the Montparnasse west Parisian suburban zone which was the first starting this kind of service, soon followed by Marseille region with the locomotives of Marseille-Blancarde depot. On the Montparnasse area, they also pulled old pre-war Talbot trains between Paris and Chartres. In the early eighties, electrification of the Tours-Angers and Le Mans-Angers-Nantes lines lead to send some BB 25500 to Tours-St Pierre depot. In 1983, the Le Mans – Nantes line was powered up in AC 25 kV. As a consequence, BB 25500 range increased. To show their operations at that time, we show at the end of this text, an analysis of the Les Aubrais and Achères BB 25500 regular duties on September 30th 1984. 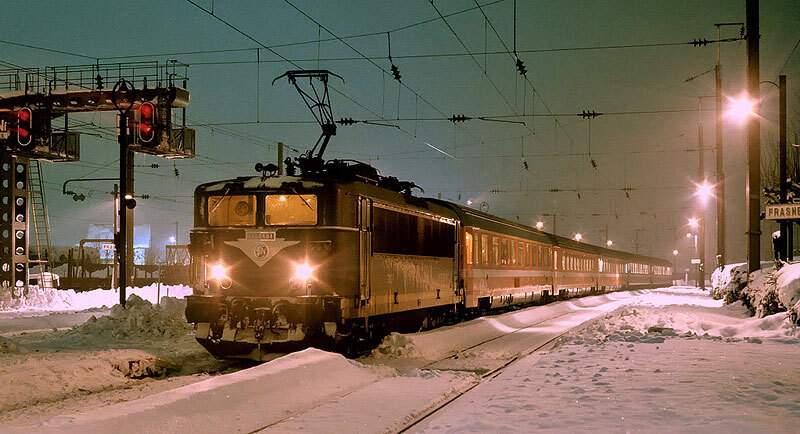 In 1985, sections from Lyon to Grenoble and from St André le Gaz to Chambéry were powered up still with AC 25 kV 50 Hz. In an area were, until then 1500 V DC was predominant, use of dual current locomotives imposed itself. BB 25500 of Dijon depot took over this new area, mainly on regional trains. In the second half of the eighties, BB 25500 took over new territories as complementary electrifications in 25 kV AC were occurring, especially in western side of France, reaching St Nazaire, le Croisic, St Brieuc. The BB 22200 fleet only left freight or regional trains to BB 25500 on shorter distances than before. Les Aubrais BB 25500 number was considerably reduced as BB 22200 from Marseille and Dijon depots had took over many freight trains between regions that were previously done with BB 25500. However, there service was still based on a twelve days period and was showing a greater variety and importance compared to the one of Tours St-Pierre. The BB 25500 of Les Aubrais depot were also frequently going to Thouars, and also to Le Havre and Sotteville and even Quévy and Aulnoye at the Belgian border. In the late eighties, the new BB 26000 appeared. Dual current and versatile, the Sybic (common name given to BB 26000) pushed the BB 25500 towards regional services with reversible RIO or RRR trains. A new depot then got some BB 25500 : Vénissieux, to cover growing regional services needs in the Lyon area. In 1992, Les Aubrais depot lost its last BB 25500. During the nineties, BB 25500 had to face hegemony of BB 22200 and 26000 on the best services requiring dual current locomotives. However, their use remains somewhat stable but on second rank services. In the late nineties, separation of locomotives by activity leaded to deep transformations in the global organization of French Railways. The BB 25500 of Achères and Dijon depot were then attributed to freight activity while the ones from Marseille and Vénissieux were attributed to TER (regional express trains) activity. A few locomotives of Marseille Blancarde were switched to freight activity to be used in multiple units on coil trains coming from Fos gulf, to Ventimiglia. Tours St-Pierre locomotives were shared between freight and TER (regional express trains). At Anthéor on the Côte d'Azur, in the Esterel characteristics red rock hills, a Corail train is seen pulled by a BB 25500 of Marseille depot in the “Concrete” livery with “Carmillon” logo. Freight activity soon decided to stop any heavy maintenance operations on its BB 25500, thus condemning them to withdrawal when reaching service mileage. The brand new BB 27000, dedicated to freight activity also took over most of BB 25500 duties. The BB 25500 were then mainly focused on TER activity. Rennes depot was given some BB 25500 for regional service with reversible trains. A dozen of « small driving cab » BB 25500 were sold to "Régiotrans" operator in Romania. Progressive withdrawal of BB 16500 dedicated to reversible RRR trains pulling leaded to their replacement by some BB 25500, then used only on 25kV 50 Hz AC. It was the case in the Nord-Pas de Calais, in Alsaceand partially in Lorraine regions (for duties to Metz-Rémilly, or Nancy – Epinal orRemiremont). Both Lens and Strasbourg depots then received some BB 25500 for these services. 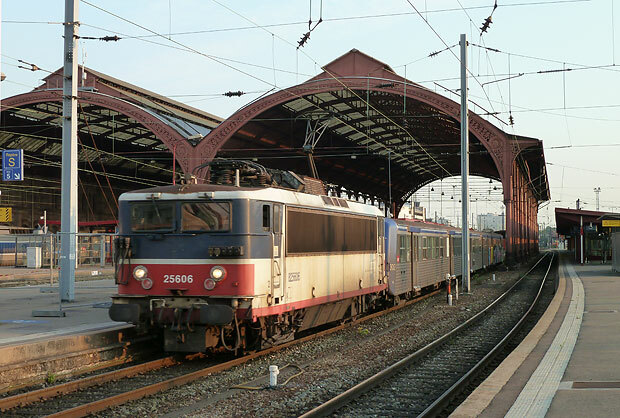 For a while, regional trains of Bourgogne-FrancheComté, Rhône-Alpes, Provence-Côte d'Azur and Brittany regions remained faithful to the BB 25500. But massive deliveries of new electric multiple units progressively lead to the BB 25500 withdrawal. A new hard blow occurred for BB 25500 when Nord-Pas de Calais and PACA regions decided to use modified BB 22200 for RRR regional trains services, thus pushing out the BB 25500 from these services. Along years, various depots using BB 25500 for regional services attributions went down to a now close end for this appreciated series of “Alsthom BB”, after more than 50 years of service ! A carrer end image. The BB 25606 is seen in Strasbourg station with a regional train to Saverne. On these kind of services, the BB 25500 had replaced withdrawn BB 16500. The BB 25606 had then kept its “Ile de France” (Parisian region) it had received when being used in Montrouge Parisian depot. Appendix : analysis of regular duty periods in September 1984. Les Aubrais and Achères depots. • Local train 6137 Orléans – Vierzon. On slow freight trains between shunting yards, some nice services could be seen such as St Pierre des Corps to Valenton, Bobigny orVaires, Villeneuve toSomain, Le Havre to Villeneuve, Lille Délivranceto Villeneuve. On bulk-freight trains, somegood services could also be noticed such as Vaires – St Pierre des Corps, St Pierre – Nantes, Valenton – Délivrance, Valenton – Lens, Vierzon – Noisy. Also to be noted was train No 74200 between St Pierre des Corps and Vaires, palnned to be pulled in multiple units every night as well as empty cars train No 69922 between Les Aubrais and Lens. Availability periods were planned in Bobigny, Vaires and Juvisy, lettig operational managers use this resource in the best possible way. It was true that the BB 25500 were almost good for any duty. This versatility was interesting for operational managers for optional traffic, including pilgrim trains from Northern France to Lourdes that they pulled up to Valenton or car-sleeper trains. Still on the BB 25500 September 1984 service in Les Aubrais, it could be noticed that the accelerated freight traffic was far from negligible in their duties. They had a very intensive service from Creil to Bobigny, Juvisy, Trappes, Lille, Valenton, Corbehem near Douai (brand new automobiles trains). Longest legs on accelerated freight trains included : Lille Champs de Mars to St Pierre des Corps or Vierzon, Creil to Vierzon, Armentières (North) to Valenton. For the same September 30th 1984 service, here is a summary of regular service fir BB 25500 of Achères depot. Service was sprayed on a 49 days period! • Few week-end trains like express No 3555 on Fridays between Le Mans and Nantes, or No 3556 in opposite direction on Thursdays and Fridays. Achères BB 25500 services looked pretty similar to the Les Aubrais ones, i.e. a majority of interregional freight trains. On the Western side, they were regularly going to Trappes, Le Mans, Rennes, Nantes, Sotteville, le Havre. In the Paris area, as for Les Aubrais locomotives, they were frequently coming on Valenton, Villeneuve, Juvisy, Le Bourget, Vaires, Bobigny, Achères shunting yards. On the Northern side, they were going up to Lille, Tergnier, Aulnoye, Lens. Several bulk-freight trains were planned with locomotives in multiple units, especially from Le Mans to Trappes, from Le Mans to Sotteville, from Bobigny to Trappes and back, from Sotteville or Le Havre to Valenton. Longest duty period took place with train No 66266 from Nantes at 7:08 AM to Le Bourget at 7:25 PM with stops in Le Mans and Trappes to add a second locomotive for multiple unit. The very same multiple unit of locomotives was then going back from Le Bourget to Rennes with train No BT 62372. During the same period, BB 25500 of Montrouge depot were used on a 35 days duty period. Drivers from other regions only knew partially these locomotives. Their use was therefore concentrated on the Western region. In the Paris area, they were going to Creil, Achères, Villeneuve, Valenton, Noisy, Juvisy, Tolbiac but were not penetrating Northern region too deeply. On the opposite, their speed ability allowed to use them on more passenger trains, especially on the Montparnasse – Le Mans – Rennes or Nantes, Nantes – Tours, Angers – Le Mans, Rennes – Laval lines.